A city with a profound history, a city that brings to life a dreamer’s imagination, a city which has the most interesting stories to tell. Yes, it is the city of Washington,D.C. 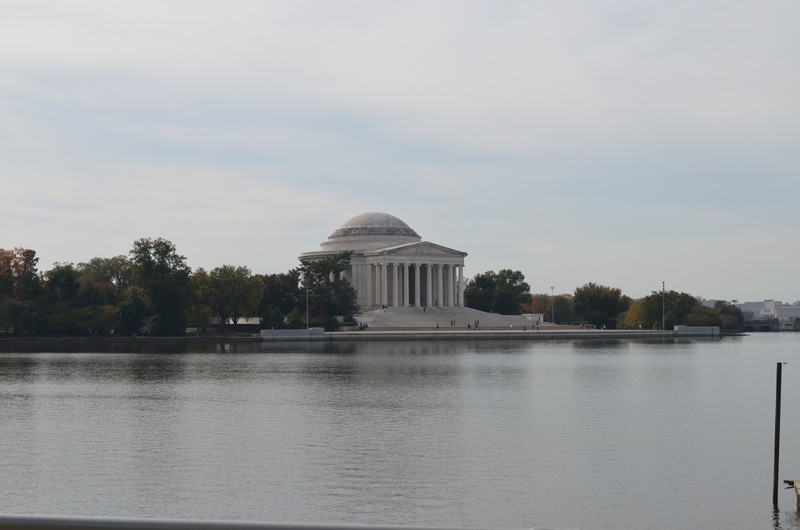 Hubby and I had been trying to find the perfect place for a small vacation from months and we both wanted to explore DC given its rich history and we did just that this weekend. DC had me at first sight! At touch down, I couldn’t help but notice what a stark difference it was to our own Chicago. DC is lush!! I was lucky to have found a window seat and to have witnessed a breathtaking sunset just as we were landing and I got luckier when our little one decided to sleep all through the flight. Talking of window seats, I never seem to be able to understand those people who shut their windows tight and doze off, or even worse, have their windows open and yet snooze?? Okay, you think they are frequent travelers and are used to the splendor below? Really? Even then,I could never NEVER do that. Flying never loses its allure to me and I do not think there has ever been a day same as another since the time the world was created. Let’s now however move on to a cup of some sort of new drink and stop sipping from my favorite cup of tea. Although I am tempted to tell you how adventurous a start we had to the holiday with us forgetting little one’s diaper bag at home and going straight to shop at DC or seeing a plane which caught fire at O’Hare, I will not do so. 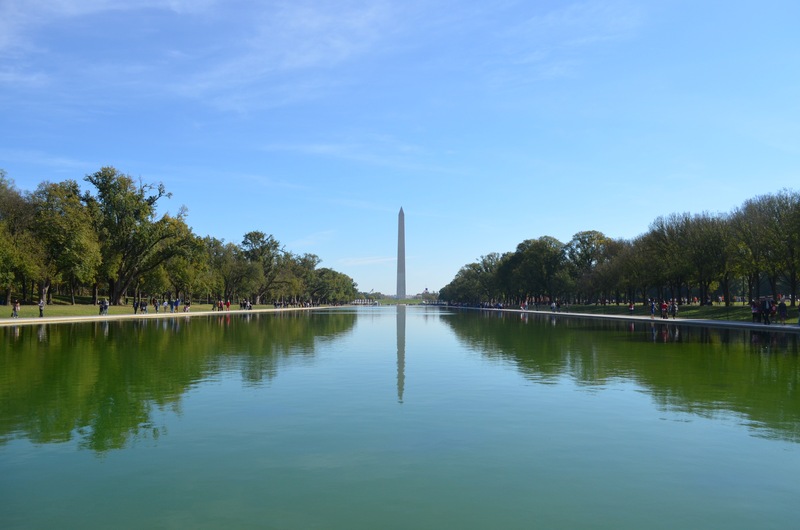 Lets go straight to the National Mall on Saturday! The National Mall here is quite the paradox! It is not a shopping mall. It’s where you must go to witness the beauty of DC . It is where all the memorials, monuments and museums are. 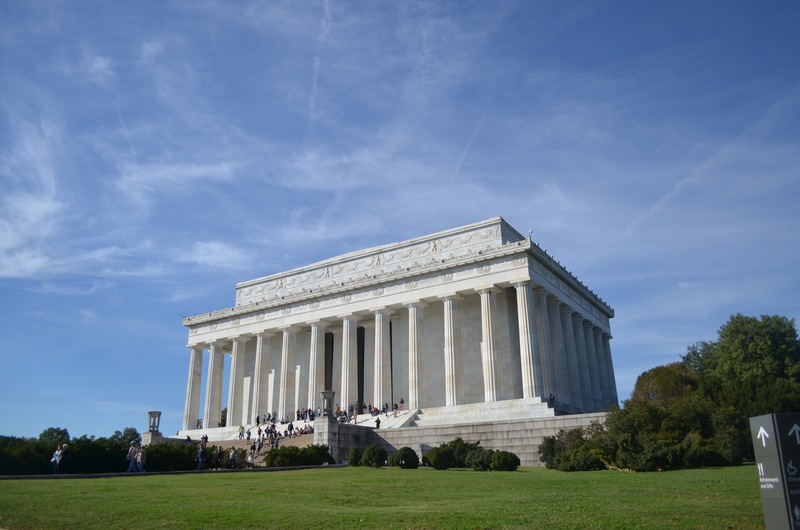 The epic Lincoln memorial, the National Monument and the Capitol are aligned in a straight line, at a distance of 1 mile exact from each other with the war memorials and museums on either side. I was always amazed by the giant sculpture of Abraham Lincoln when I saw it in movies or pictures, but to actually see it in person was a beautiful experience. 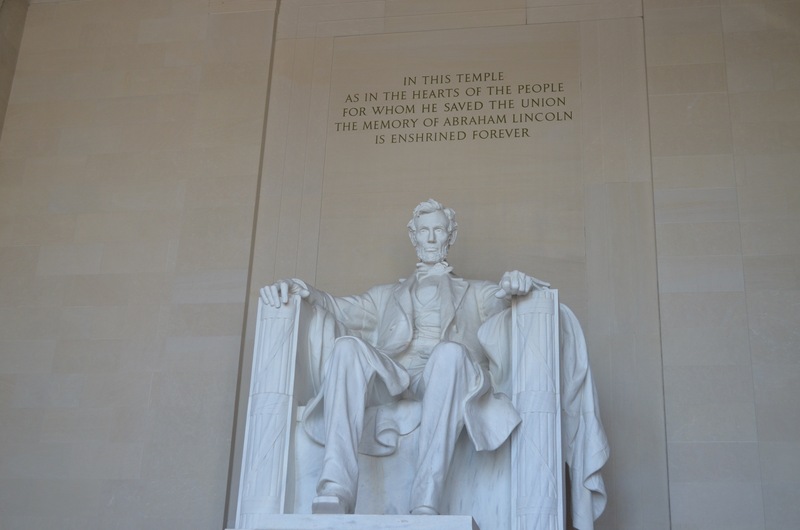 If it hadn’t been for the thronging people around me, I might have been a little spooked by the stern look of Abe with his left hand clenched in a fist and his overpowering gaze which seems to follow you to every corner of the great memorial building. Every word of the great orator’s famous eloquent speech is etched on the wall of this beautiful memorial architecture. After bidding adieu to Abe, we walked to the Korean war memorial. This memorial was one of my favorites. 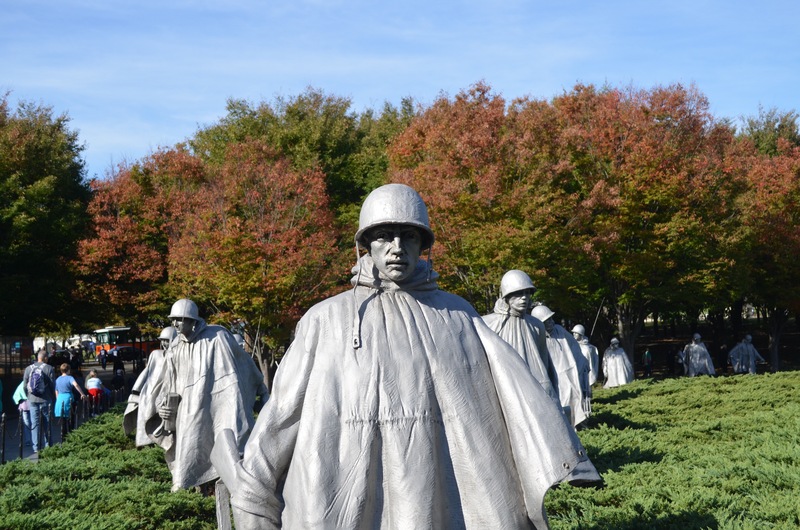 The sculptures of the soldiers from the Korean war which killed more than 54000 US soldiers leave you heavy-hearted and I cannot promise you that they may not appear in your bleak dreams in the night, leaving you haunted with the look in their young innocent eyes. The Vietnam war memorial which we visited next had the same effect on us with thousands and thousands of names of the men and women who lost their lives or went missing in the war inscribed on the walls made of black granite which were imported from Bangalore, India. I wondered how gruesome it must have been to witness such a massive loss of lives when just looking at so many names on the walls leaves you feeling dejected. We waddled along next making our way through the crunchy fall leaves on the ground to the National Museum of American History which kept us hooked with stories of the American presidents and a wide display of the dresses the first ladies wore and the china they used. The security guard at this museum surely gave me strange looks when he caught me running back to admire Jackie Kennedy’s dress every five minutes. 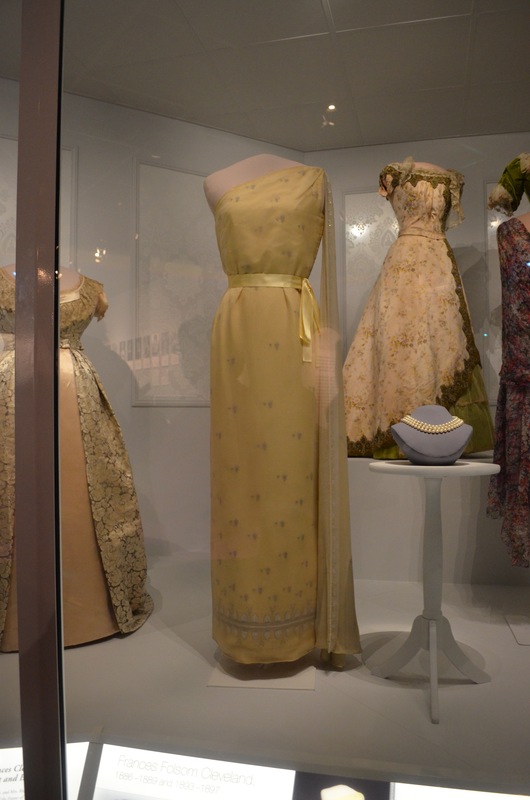 I have always harboured a fascination for her and her off-shoulder silk gown in pale yellow was clearly the highlight of my evening.We ended our tour to the mall with the Capitol Hill which lived up to our expectations. The majestic architecture basking in the balmy sun with the bright blue sky above certainly did not disappoint us. Our visit to the Arlington Cemetery at Virginia on Sunday was disrupted by the Marine Corps Marathon which had close to 30,000 people running enthusiastically. With this sudden change of schedule we decided to tour the Holocaust museum which we had initially decided against given its atrocious background. We finished just in time for our flight in the evening. 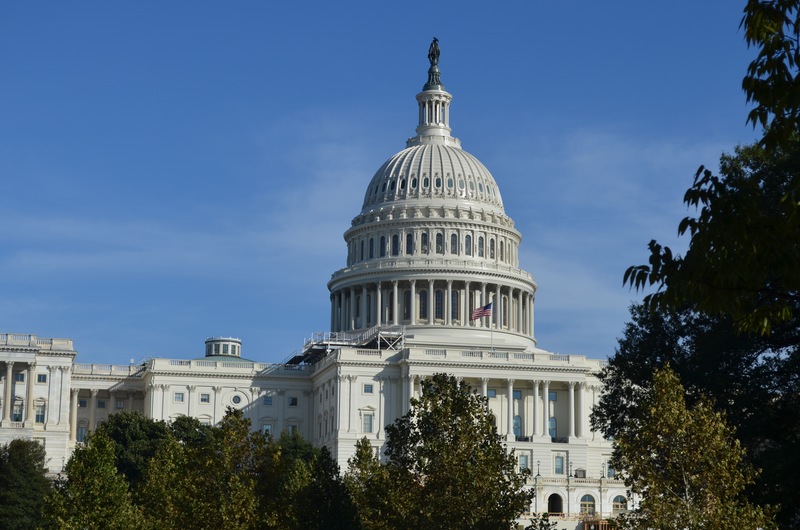 Washington DC has so many stories to tell that we left with a promise to return someday to explore each one of it’s museums, to walk around the beautiful Arlington Cemetry, to stroll in the neighborhood of Georgetown. As our flight took off at twilight, I looked down at this beautiful city one last time with its proud monuments which has an important message for all, that Freedom is not Free. A room definitely with a view!! I woke up this morning with an unimaginable fervor to write. Yes, we all need to do this, find a source of inspiration and I have kind of found mine. No it’s not coffee, its my window!! I have this trick of keeping the blinds slightly open, at the right angle,so that you are able to see from the inside, but it appears shut from the out. Why do I need them open?? Well, it’s a long story, but who is in a hurry,right? So I like seeing the planes fly by in the night!! I sound like an eight year old? I feared it!! But wait till you judge me with all the prejudice of childishness. When I was a kid, and there was the sound of an aircraft flying by, we ran to the backyard to get a glimpse of the tiny dot up in the air and when I say we, I mean my parents too. No, I was not born in an age when aviation was new, ain’t that old! No, I do not belong to an underdeveloped nation either, but airplanes in the sky wasn’t really a common occurrence then. It’s funny how we got to say hello to our neighbors at such occasions when they got to their respective backyards or porches too. Okay, before you convict me of going astray,let me come right back to what I am trying to mean here. I think it makes me smile,it makes me happy, excited and grateful all at once when I see planes fly by one after the other. It makes me smile when I dwell a little in the past, and I think to myself, thats not something I had imagined when I was a kid. I had never thought I would have a window which would give me such splendid views night after night. Anyway, so what got me inspired in the morning is the the damned view again. Pardon the profanity, but really, damn the view! How can one remain calm when one has such a lovely view? L.M. Montgomery said, she was glad she lived in a world where there were Octobers! and boy!! do I know what she means!! 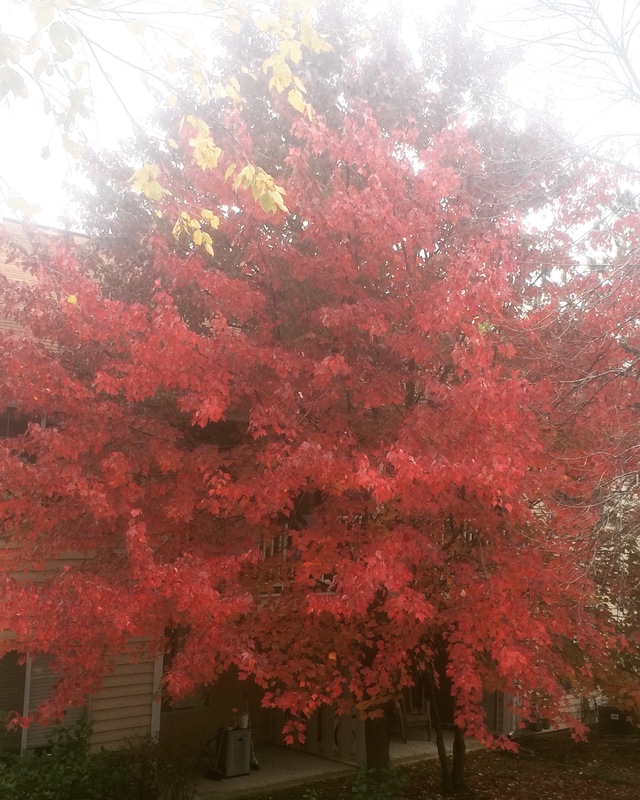 Our room is a burst of red in the mornings and may this sweet little tree by our window be the absolute last tree in the world this fall to have its pretty little leaves wither off. With this overwhelming prettiness all around us, we are heading to a beautiful city on a mini vacation this weekend which they say isn’t too bad for a fall visit☺️. I shall not tell you where it is as yet, let’s just say it’s not too far away, perhaps the perfect place to start off what we hope is the beginning of a series of vacations 😉. The weather being a lot warmer there than it is here, I think I might have to redo my packing and pull out the sweaters from the suitcase(No,it’s not california😜 and yes, I do have a couple of tempting knit wears to choose from). Wait till my next post for pictures of the place and of what I finally hope to make up my mind on wearing!! Until then, have a fab weekend you gorgeous people❤️.